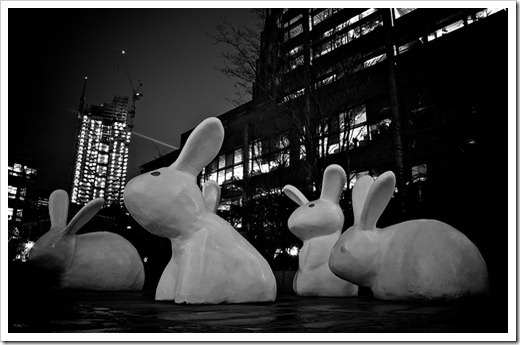 How cool are these giant rabbit sculptures in London which showed up as the Photo of the Day [^] on Londonist. The sculpture is Spitalfield Spirit [^] by Paul Cox, and is supposed to represent the large, close knit communities of the East End. They have just gone on to my “UK Must-Do” list, so let’s hope they hang around. Posted in: Links, London, Photography Sites.